The public relations team at United had probably just started to breathe easy after the infamous “leggings” crisis when a second PR disaster hit. And this one’s a doozy. Late Sunday, a United passenger who refused to give up his seat on an overbooked flight was forcibly removed from the plane by police, to the horror of other passengers. 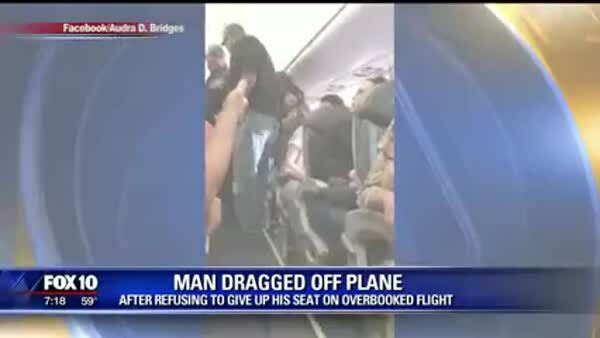 Many captured the scene on their smartphones, and the video was more shocking than the headline; the man is screaming as he is wrenched from his window seat and dragged down the aisle, his face bleeding after apparently hitting an armrest. It’s the kind of treatment you can only imagine if he were a physical threat or a terror suspect, not an ordinary passenger. The video, which went viral by Monday morning after being posted on Facebook by another passenger, is very disturbing. But for public relations and crisis experts, United’s immediate response was also troubling. As of midday Monday, the airline had issued the following statement. You don’t need to be a PR professional to think this is a pretty poor response. There’s no apology for the passenger’s humiliation, inconvenience, and injury. There’s no explanation for the use of force, and in fact the statement omits the bit about dragging a screaming, bleeding man from his seat. United uses the word “voluntarily” in an interesting way (if you don’t want to volunteer, we’ll make you!) and then passes the buck to unnamed “authorities” who were clearly acting at its behest. The first rule of a case like this is to take responsibility. The initial response amounts to an utter abdication of that. And it clearly could have been handled more skillfully. According to other passengers on the flight, the airline said it needed four seats to fly its own employees to Louisville. It offered as much as $800 and a hotel stay to anyone who would volunteer to take a later flight, but it had no takers. Technically, United was within its rights to remove passengers; nearly every ticket we buy contains small print about the risk of being bumped. But airlines typically negotiate for volunteers before the flight is boarded, not after they’re seated on the plane. More importantly, there would seem to be better ways of persuading a reluctant “volunteer” than by force. A second statement released by United CEO Oscar Munoz on Monday wasn’t much of an improvement on the first. “Re-accommodate”? Really? The statement here is vaguely worded; United seems to be apologizing to its own crew, or possibly to passengers who witnessed the incident. Its use of “re-accommodate” is positively Orwellian. It still doesn’t take any responsibility for the decision to use force or the chaos and injury that ensued. What’s more, comments by United spokesperson Charles Hobart in a New York Times interview seem to blame the passenger for refusing to leave after being asked repeatedly and – as Hobart takes pains to emphasize – politely. “We explained the scenario to the customer,” Mr. Hobart said. “That customer chose not to get out of his seat.” United is blameless, he seems to say. Blaming others – even when it reflects the reality of a situation – is nearly always a losing proposition in a public apology. Again, the airline is technically within its rights, but it’s shocking to me that, as the video continues to be shared by social and traditional media, United has not admitted that it badly mistreated a paying passenger and mishandled a common enough situation that could have been defused with far less effort and expense. Nor has it announced that it will try to limit overbooking, or pledge to handle it differently in the future. The non-apology apologies are only fueling anger and ridicule on social media. The airline offered up to $800 for anyone willing to give up his seat and fly later. What if it had offered more – $1000 or even $5000? If that seems expensive, look at the video, think about the outrage, and consider the reputation damage involved. And what if the airline had taken a page from Pepsi, which suffered through a different, but embarrassing and expensive mistake last week, yet handled it deftly and gracefully? It’s hard to put a price tag on reputation. But this latest incident should make the airline and its peers straighten up and fly right, at least on the communications front. Because the harm to the United brand will far outweigh the cost of doing the right thing. Note: After posting I read this excellent article about the power of the airline industry post-consolidation, which states that an airline can only legally compensate bumped passengers up to $1350. Even so, United should and could have handled this very differently.